Seriously, I don't think I've ever found it more difficult to write a review. Listen: The readers who say that nothing much happens, especially in the first 400 pages? THEY ARE RIGHT. But do you know what else? It doesn't matter. Stick with it. Let yourself be swept away (or dragged along) and you won't regret it. 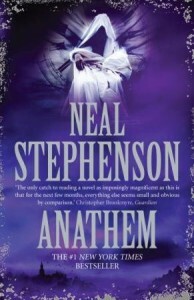 To begin with, Stephenson cheerfully engages in some of the most meticulous worldbuilding I've ever seen, starting with a 3000-year historical timeline (a bit daunting but very much helpful, in the end) and taunting us with freshly minted words that the narrator "was forced to coin" in order to explain the world. I can see where this puts some people off, but if you are at all interested in language, the whole exercise becomes fascinating. Every chapter is introduced by a dictionary definition covering not just a word's meaning, but also how its meaning has changed over three distinct eras in his world's history. This is awesome. Also, freshly coined or not, if you're an English speaker with a bit of linguistic awareness you'll note how Stephenson draws on Latin/Italian, French and Dutch/Anglo Saxon - much like English did itself. Again: THIS IS AWESOME. Maybe you're not interested in languages. Fine, how about western philosophy? The brothers and sisters in Stephenson's 'maths' (cloisters) are engaged in science, logic, ethics, and metaphysics - basically, Anathem is a primer on Aristotle. Once more: This? Is awesome. This is not to say they live in some kind of pre-industrial world. This is science fiction, after all. From genetic engineering to mobile phones and 'new matter', Arbre is technologically slightly more advanced than Earth in the 21st century. However, the entire first half of the book isn't really concerned with the world outside the math's walls. If you find that boring, I can't help you. If you don't, you're in for a treat. The story unfolds slowly, giving you a chance to wrap your head around the world and the concept of the maths and the role they play in the wider scheme of things. These people are the foremost scientist in Arbre, after all. By the time the aliens arrive, it's clear that it's the fras and surs who are called in to deal with the problem. This is where the pace picks up, but not by much. Even in times of crisis, these folks have time for a Dialogue or two. All in all, Anathem won't be for everyone. This is not a quick read. Sometimes, you need to refer to the glossary. Sometimes, they totally lost me in their logic puzzles, and I certainly didn't get most of the mathematic principles discussed, but the point is: I didn't care. It didn't matter. I worship unrepentantly at Stephenson's altar. The man is a genius.